The Château de Candé is a castle located in the commune of Monts, Indre-et-Loire, 10 km (6 mi) to the south of Tours on the border of the Indre River in France. The first known Lord of Candé was Macé de Larçay, in 1313. 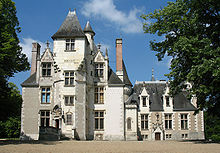 François Briçonnet, the mayor of Tours and state treasurer, purchased the fief in 1499 and built a Renaissance house on the site of the old fortress. He died before the building was finished, and it was completed by his daughter, Jeanne, in 1508. Several owners succeeded to the estate, but none brought major transformations to the castle. According to terms of a sale contract dated 28 June 1715 between Georges-François de Guénand, seigneur de l'Étang and Pierre Anguille de la Niverdière, the land consisted of a château-fort, enclosed walls, ditches, drawbridge, barns, gardens, orchards, vines, mature wood of standing timbers and coppice, wild rabbits, and many other things. On 24 June 1853, Santiago Drake del Castillo, heir of a wealthy plantation owner, acquired the castle. At this time the northern wing was added, in the neo-gothic style; this tripled the living space. M. Drake del Castllo also founded a free school for some sixty young girls, in the valley between the château and the railway right-of-way. In 1927, Charles Bedaux, a Franco-American industrial millionaire, and his wife Fern, purchased the castle from Jean Drake del Castillo, the grandson of Santiago. They carried out substantial work to modernise the castle, such as adding a plumbing system, improving the electrical system and installing central heating in all parts of the building, with 60 tons of pipes installed in the walls. The eight bedrooms are each equipped with a bathroom in the art déco style; all have baths equipped with an American system, making it possible to fill and empty a bathtub in less than one minute. Indoor toilets were also added. Bedaux installed a telephone, which at the time was unique in a French residence; it was directly connected to the exchange in Tours, and therefore required an operator to be present in the castle. A golf course with 18 holes, a tennis court, a gymnasium and a solarium were also built at this time. In 1937, the marriage of the Duke of Windsor (formerly King Edward VIII), and Wallis Simpson took place here. Cecil Beaton took their wedding photos here as well. On the death of Fern Bedaux in 1972, the castle was bequeathed to the State, which reassigned it to the council of Indre-et-Loire in 1974. ^ Jacques Xavier Carré de Busserolle, Dictionnaire géographique, historique et biographique 1879, s.v. "Candé"
^ Carré de Busserolle, loc. cit..
^ Carré de Busserolle, loc. cit. ; "Monts - OT Val de l'Indre (UK)". Retrieved 2008-09-03. ^ a b c "Candé fait revivre les années 30" (in French). Retrieved 2008-09-03. ^ "Candé fait revivre les années 30 (suite)" (in French). Retrieved 2008-09-03. ^ Howarth, Patrick (1987). George VI. (Hutchinson), p.73; "Edward VIII Photographs, Abdication Speech, Chateau de Cande". Retrieved 2008-09-03. Charles Glass, Americans in Paris: Life and Death Under Nazi Occupation, Harper Collins, U.K. ISBN 978-0-00-722853-9. This page was last edited on 7 August 2017, at 15:48 (UTC).